The purpose of this page is to help you get to know Bishop Gallegos, who was a member of the Order of Augustinian Recollects and Auxiliary Bishop of the Diocese of Sacramento, California, and whose cause for beatification and canonization was introduced to the Vatican in Rome in November, 2006. 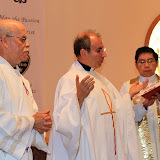 Here you will be able to read the latest news concerning activities related to the Cause of Bishop Gallegos, learn more about his extraordinary life and works, and have the opportunity to share experiences you may have had with the Bishop or relate any special favors you may have received through his intercession. At this point in the process of beatification and canonization we are praying for miracles on behalf of Bishop Gallegos, which are God's way of confirming the reputation of holiness and heroic charity of one of his sons or daughters in the Catholic Church. We invite you, then, to pray with us for the advancement of the Cause of Bishop Gallegos and that the good work he has begun-especially his concern for youth, immigrants, the poor, the unborn, and the physically and mentally challenged-may continue to be remembered and imitated by all of God's people.